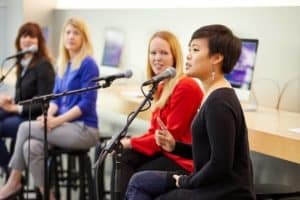 During the month of February, Echo-Factory planned, promoted and hosted a series of Women in Tech panels at Apple stores in Old Pasadena and Santa Monica. These events, featuring major local tech players, including Renée LaBran, senior advisor to Idealab, Max Powers, senior vice president of business operations at TeleSign, Natalie Sun, creative technologist and founder of NextArt, and Anna Barber, managing director at Techstars, centered around the advantages women bring to the industry, along with advice for tech companies looking to include more women and for techy women looking to advance. Before attending these events, I hadn’t considered myself the right audience for Women in Tech. While I can get behind any cause that champions diversity, I’m not angling for a Google offer or prepping my resume for Facebook. Yes, I dabble in HTML and do a whole lot of SEO work for our Echo-Factory clients, but I consider those duties to be technical things I do in a non-tech job. I’m also living in a “fairness” bubble, working in a company with male and female owners, alongside men and women in positions of leadership, which has left me somewhat removed from the battle for inclusion that continues to be waged. However, I have come to find the Women in Tech movement is less about the field and more about the shared struggle women continue to endure to gain entry to sophisticated work environments. Both mornings, the Apple store felt closer to prime time rather than 8 a.m. on a Wednesday. The audience, made up of women and men, was alert and ready to engage our panel. As our speakers warmed up the crowd with introductions and personal anecdotes, I found more shared experiences than I had thought possible. The smiles and nods of knowing agreement around the room seemed to indicate that our audience did too. Despite discussions of obstacles, the conversation didn’t devolve into a man-bashing pity party. Instead, everyone exuded positivity, taking note of the good advice of our speakers. You could feel how excited we all were for the not-so-distant future of the tech world. After a short Q and A, a back area was opened for attendees looking to engage the speakers in person. A surprising number of women swarmed our professionals, all with their own tales of assistant mix-ups and coffee requests, along with the techniques they’ve personally used to circumvent incidences like these and navigate male-dominated workplaces. 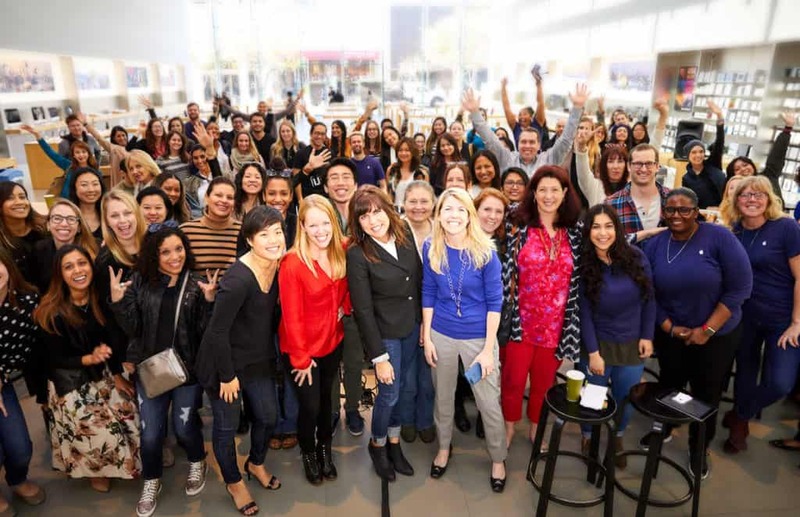 In this arena, I met small business owners, entrepreneurs and techy women—all with the aim to shine, not in spite of their male counterparts, but because of a desire to do their personal best. 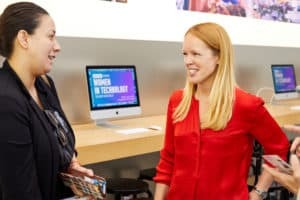 After our Women in Tech series ended, I met with Dea Goldsmith, the moderator, Echo-Factory co-founder and chief creative officer (a titan herself), to discuss the events in more detail. Traditionally, Echo-Factory has done more marketing-focused events. What made you want to pursue this topic? We work closely with a number of tech companies, including those in the clean tech sector. Our job is to help them tell their story in a way that is relatable to those outside of the industry. My team and I work closely with technology to make this happen. Echo-Factory also works closely with Innovate Pasadena, a group that brings together tech startups and investors in the city. Having this exposure, coupled with my own history in a traditionally male-dominated and managed profession, made this movement feel very relevant and one of personal interest. What was most surprising about these events? Our tech panel had one major commonality: They entered the tech world without asking permission. They brought their own backgrounds, all of them non-tech, and became self-taught experts. They didn’t wait for the ideal job or until they had the perfect skill sets—they created their own opportunities. And, when they discussed their own moments of doubt, instead of buckling under fear, they developed strategies like seeking out mentors, books and any other constructive resources to help them surmount obstacles. Our speakers also knew they were part of something bigger and, while that movement wasn’t always Women in Tech, having that larger goal really allowed them to push through difficulties. This has been an effective strategy I’ve personally used with great effect. When our goals are too small, that means they are often just about us. It’s easier to fight through a situation when you know you’re doing it for a larger reason. What did you view as some of the best advice from our panelists? I really loved the idea of creating your own seat at the table. Sometimes the elements that make women such excellent teammates and collaborators can leave them behind when it’s time to shine. These powerful women share many of the same fears and self-sabotaging habits as our audience—they’ve just figured out ways to overcome them. The advice from the panel on controlling negative emotions, their call for us to step out of our comfort zones and the importance of finding colleagues for extra support, seem so obvious now, but were a great reminder. I also really appreciated the tips for those in positions of power. Creating a work culture that truly embraces diversity, not just in word, but also through active initiatives and critical evaluation, is the only way to ensure that, once women get through the door, they stay. After one of the events, a gentleman approached our group (a small mob had formed around Max Powers as she answered questions). He was concerned about her team management methods and, instead, suggested we treat others like our always beaming, coddling first-grade teacher. He thought it might be best for Max to return to more traditional methods of approaching the tech sector (you know, with cookies and a polite smile and a hope that those in charge might let us in). Max politely said she’d consider it (while it was clear she would not), and the group quickly worked to turn the subject back toward one of productivity. But his comments served as a good reminder of why this conversation needs to continue. In a room with predominantly likeminded people, it can feel like the discussion has maybe run its course. Clearly, there are still minds that remain to be changed, and there is work that needs to be done. Luckily, we have the women for the job.